Sale of Under-Construction Property : How to calculate Capital Gains? You are here: Home / Real Estate / How to calculate Holding Period & Capital Gains on sale of an Under-Construction property? Buying a property (home/plot/flat) is one of the most important decisions that you will ever make. It involves a lot of money and is a serious money decision. It is an emotional one too! There can be instances where you had to sell a property due to various reasons. In case, you wish to sell an already constructed property (ready-to-move-in) then it is pretty straight-forward to calculate the holding period and capital gains (if any). For example : Mr Pawan Kalyan has bought a ready-to-move-in property through a Registered Sale Deed and sells (re-sale) it to Mr Chiranjeevi (for a profit) in 2018. Here, the holding period for this transaction is 3 years (2018-2015) and the gains are treated as Long Term Capital Gains. So, the holding period is calculated from the date of registration (in his name) to date of Sale. If Land or house property is held for 36 months or less 24 months or less (w.e.f. FY 2017-18) then that Asset is treated as Short Term Capital Asset. You as an investor will make either Short Term Capital Gain (STCG) or Short Term Capital Loss (STCL) on that investment. If Land or house property is held for more than 36 months more than 24 months (w.e.f FY 2017-18 / AY 2018-19) then that Asset is treated as Long Term Capital Asset. You will make either Long Term Capital Gain (LTCG) or Long Term Capital Loss (LTCL) on that investment. What if Mr Pawan Kalyan books an Under-construction property by paying Rs 10 Lakhs to a builder. He gets a ‘Flat allotment letter’ after paying the booking advance. But, the property is yet to be registered in his name. He then decides to re-sell it before taking the possession / registering it. In this scenario, as the property is not yet Registered, how to calculate the holding period? 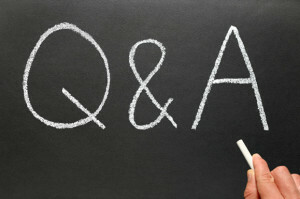 On what basis the holding period and capital gains can be calculated? – Let’s discuss…. How is Holding Period calculated on sale of an Under-Construction Property? 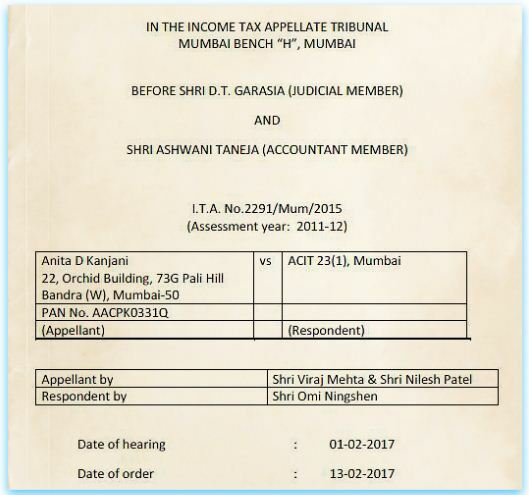 Capital gains on transfer of property has always been a reason for dispute between the taxpayers and IT authorities. While the Income Tax Act mentions that the period of holding determines the amount of tax payable, it does not clearly specify from when the period of holding actually starts. Does it start from the date of allotment (or) from the day the sale deed is signed or when a property is registered? Though there are certain ambiguities related to the calculation of holding period for an under-construction property, there have been several court judgments in different cases. The biggest question (as mentioned above) pops up while calculating holding period — whether it has to be calculated from the date on which the property was booked (or) agreement has been done (or) date of registration (if any) or its possession date. As per the Supreme Court order, the Date of registration (Title Deed/Sale Deed) should be considered as date of acquisition while calculating the holding period and Capital Gains. Let’s say you have booked a Flat by paying the required down-payment or initial booking amount on 1st April, 2014. The builder then issued you an Allotment letter on the very same day. The builder and you enter into an Agreement of Sale on 1st May, 2014. The property is still under-construction and you decide to re-sell it to some other buyer. The re-sale (with gains) happened on 1st March, 2018. Under this scenario, once you pay a booking amount, the builder might allocate a Flat in your name and issue an ‘Allotment Letter’ to this effect. 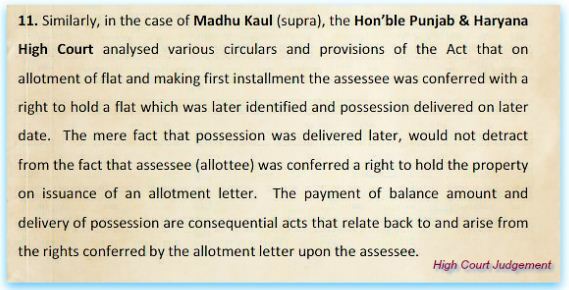 In such a case, the holding period can be calculated from the Date of Allotment of property. In this example, the holding period is more than 2 years (2018-2014), hence the capital gains made by you are treated as Long Term Capital Gains. Kindly click on the below image to download the IT Tribunal order and various High-court judgements on this matter. There can be instances where, the builder can clearly state in the Allotment letter that it does not confer you any ownership right. In such circumstances, the date of Agreement can be considered for holding-period calculation. Let’s say you have booked a Flat by paying the required down-payment or initial booking amount on 1st March, 2016. The builder then issued you an Allotment letter on the very same day. The builder and you enter into an Agreement of Sale on 1st May, 2016. You have paid all the installments to the builder and also received the possession certificate from them. But, you are yet to get the Registration done in your name. Meanwhile, you decide to re-sell it to some other buyer. The re-sale (with gains) happened on 10th March, 2018. Under this scenario, if you consider ‘Date of possession’ for holding period calculation then your capital gains fall under Short term capital gains and you have to pay taxes based on your income tax slab rate, which can be a hefty amount. Even in this case, you can consider ‘Date of allotment‘ for calculation of holding period and your capital gains can then become Long Term Capital gains, as your holding period is more than 2 years on date of re-sale (2018-2016). Let’s say you have booked a Flat by paying the required down-payment or initial booking amount on 1st March, 2014. The builder then issued you an Allotment letter on the very same day. The builder and you enter into an Agreement of Sale on 1st May, 2014. You have paid all the installments to the builder and the Registration in your name has been done on 1st March, 2016. The possession certificate has also been issued by them on 1st March, 2017. You then decide to re-sell it to some other buyer. The re-sale (with gains) happened on 10th March, 2018. This can be a trick one! Under this scenario, you can consider ‘Date of Registration’ for holding period and capital gains calculations purposes. If the registration date is used then holding period is long-term and in case, you use the possession date then your gains can be considered as short-term capital gains. Some experts may argue that the ‘allotment date’ can be considered instead of the ‘registration date’. This is where , you can find conflicting judgement orders given by the honorable Supreme court and IT Tribunals / High courts. How to calculate Capital Gains on sale of property? STCG = Total Sale Price – Cost of acquisition – expenses directly related to sale – cost of improvements. The LTCG calculation is similar to STCG. The only differences are, you are allowed to deduct Indexed Cost of Acquisition/Indexed Cost of Improvements from the sale price and also claim certain exemptions to save capital gains tax. In case you acquire a property, which was under construction at the time of allotment and payments were made in installment basis then any payments made before allotment is to be provided indexation from the date of allotment and any payment made after is to be provided benefit of indexation from the date the payment is made. With effective from Financial Year 2017-18, the base year for calculation of Indexation is going to be 2001. 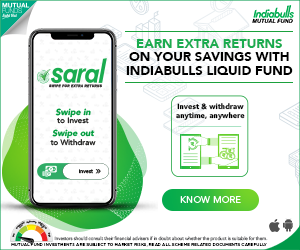 (Indexation is done by applying CII – cost inflation index. This increases your cost base ie purchase price and lowers your gains. Your purchase price is adjusted for the impact of inflation. How do you calculate the indexed cost of purchase? The indexed cost is calculated with the help of a table of cost inflation index. Divide the cost at which you purchased the Property by the index as on the date of the purchase. Multiply this by the index as on the date of sale. 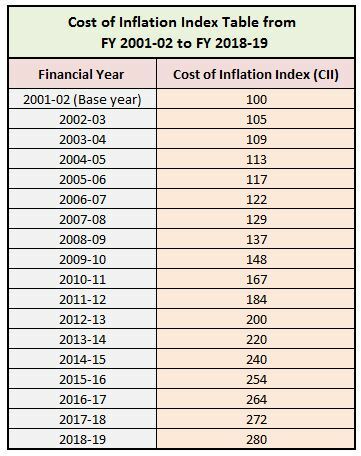 Below is the Cost Inflation Index Table from 2001-02 to FY 2018-19 for your reference. Cost Inflation Index (CII) for FY 2018-19/ AY 2019-20 Notified by CBDT at 280. In case you sell a property booked by you before you get it registered or take the possession, the taxability of profits made on such sale will depend on the time interval between your date of booking the property (or) the date of agreement to transfer your right in the under construction property. In case, you sell a property booked by you after getting the registration done or taking the possession then the Tax treatment in such case will depend on the facts of the case, as there are conflicting views and court judgements. Hence, it is prudent to consult a legal / tax expert in this regard. Under Construction House : How to claim Tax deduction on Home Loan Interest payments? Hi Sreekanth, I had purchased a property in Mar 2003 and sold it in Jan ’19. The property was taken at Rs. 570540, and I had also taken an amount of Rs 7 lacs for renovation a few years back. As I have sold the property, want your help to understand that what will be the amount that I am supposed to pay as an Income Tax as there is no plan of re-investment in any property as such. Appreciate your guidance. Under this scenario, you might be realizing Long Term capital gains on this transaction. You have to deduct the indexed cost price (purchase price) and indexed cost of improvement from the Sale price. The net Long Term Capital Gains will be taxed at 20%. You may kindly go through this article @ How to save Capital Gains Tax on Sale of Land / House Property? Can you also help as how to calculate indexed cost of improvement? This article can give you some idea about the calculation part..
You may kindly consult a Chartered Accountant regarding the exact calculations applicable to your case. Is the project registered under RERA? Hi Sreekanth, thanks for your quick response. Yes, it is registered under RERA. I shall go through the links provided, thanks for your time. I booked a residential apartment in Aug 2012 and allotment letter was given in Nov 2012. I have received Offer of possession in March 2018 and paid all the remaining dues on 12th March 2018. The builder has not yet registered the property in my name and will be done in few more days. I am stuck between the decision to rent it or sell it. Kindly help me regarding following questions. 1) will this property be counted as to be “constructed within 5 years” clause of income tax laws ? 2) If I sell this property after registry within FY 2018-2019, will it be considered as a short term capital gains or a LTCG. 3) Since my employer has already deducted tax from my salary, if I need to get tax benefit on interest paid in loan during 2016-2017 (as it is the year in which possession is offered), I will need to file return with a refund ? 4) Can I get tax benefit on the Prior Period Interest ( from 2012 till March 2017) ? 1 – When did you take home loan? “In view of the fact that housing projects often take longer time for completion, it is proposed that clause (b) of section 24 be amended to provide that the Deduction under the said provision on account of Interest paid on Home Loan for acquisition or construction of a self-occupied house property shall be available if the acquisition or construction is completed within FIVE years from the end of the financial year in which capital was borrowed. 2 – If you sell the property immediately after the Registration (in FY 2018-19) then you may have to consider it STCG (however this can be subjective). 3, 4 & 5 – Have you accepted the offer of PC? If the property is not yet registered in your name, I believe you may not be eligible to claim tax benefits. It is LTCG, as the holding period is more than 2 years.. I have query regarding to take the benifit on home loan interest in Incometax . How much I will take the benifit? Pls, do the needful for the same. The maximum that can be claimed as loss under the head ‘income from house property’ is Rs 2 Lakhs. Income from House property & tax implications! Thanks a lot for the valuable replay. What would happen in a scenario where I have sold a residential house and then bought a plot of land to construct a house? When i buy the land, it will be registered, but does this date count for purpose of calculating holding period? Or do we have to get some sort of completion certificate from any authority for construction of house to calculate holding period? The registration date of ‘buying plot’ can be considered as the date of purchase and holding period can be calculated from that date. Will try to publish one more article with solved examples!